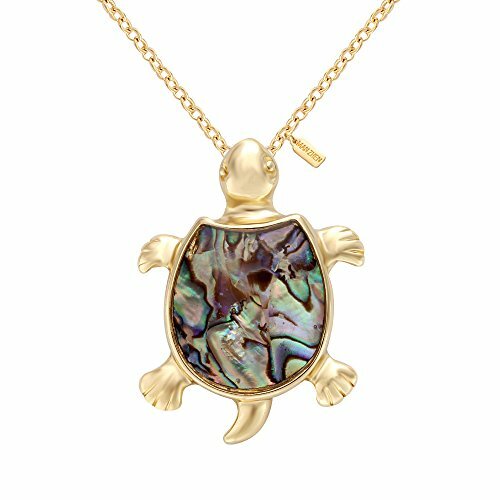 Item type: Necklace Material: Alloy zinc,natural abalone shell Color:Gold/Rose Gold Gender: Unisex Style:Trendy Pendant size:38*43mm(1.2*1.7'') Chain length:457(18'') All of our jewelry is 100% real rhodium,gold and copper plated,which makes jewelry more attractive and more durable. Unique design,when you wear it,make you more charming,confident. We promised that sending you our high quality jewelry and providing our best service to you .If you have any questions, please don't heasitate to contact us through Amazon.,we will try our best to satisfied our every client. Jewelry also has a life and need your care and protection. Firstly,you shuold keep your Jewelry away from any chemicals,you know the chemicals will corrode your jewelry. Secondly,please do not put your jewelry into water especially seawater ofen,water will fade jewelry's color. Three,Please clean your jewelry with clean and dry duster ofen,to keep your jewelry clean. At last,when you don't wear your jewelry,please clean it and put in a sealed box. Item:Pendants Stone Name: Abalone Shell (Natural) Stone Size:about 30x53mm (As it is natural stone,each one's shape and stone's size and stone's line isn't same,pls take note at it with thanks. 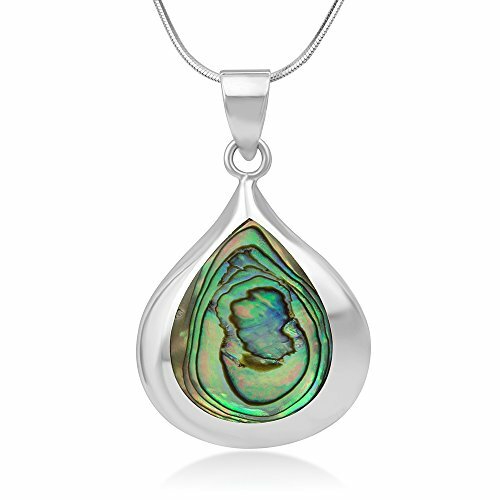 This beautiful Abalone necklace would be a wonderful addition to any wardrobe. The included black velvet pouch also makes it the perfect gift for someone special. 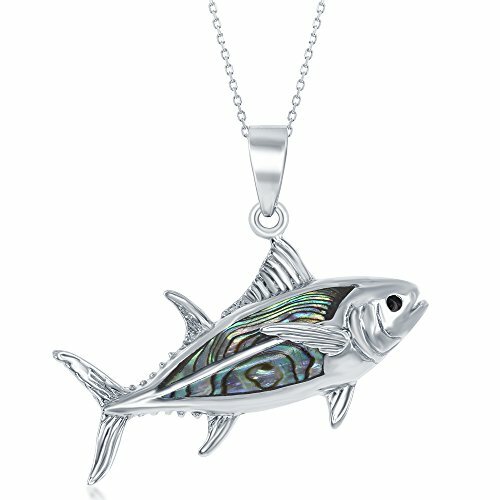 Made from high quality 925 sterling silver, stamped 925 and natural Abalone Shell. The pendant comes with the sterling silver snake chain 18'' About Chuvora JewelryChuvora Jewelry is a Mystic Clothing brand based in Palm Coast, Florida. Despite our rapid growth, we have remained loyal to our original hallmarks: Quality and value, ease of ordering, and integrity. GemstonesWhen present, gemstones may have been treated to enhance properties such as color and durability. See listing details for treatment disclosure information. Jewelry Care While Chuvora products are designed to last, proper care is an important part of keeping your jewelry looking it's best. Be sure not to wear your jewelry while cleaning or working with harsh chemicals, in pools or spas, or while playing sports. Store your jewelry individually to keep them from scratching each other. Store sterling silver jewelry with anti-tarnish strips to keep them looking their best. To clean your jewelry, use a warm, soapy water soak and a soft brush - especially when cleaning jewelry that contains gemstones. Product Name: mix shaped natural abalone shell charm 3 pack Brand: SPUNKYCHARMS Weight: about 0.65 ounce each package Sizes: Owl (2.8" L * 1.1" W * 0.5" H). Butterfly (3" L * 1.5" W * 0.5" H). 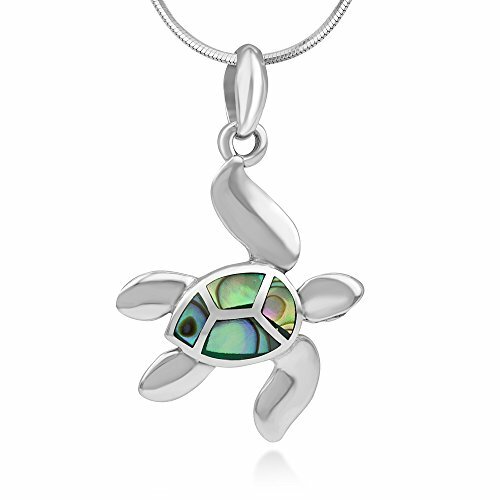 Tortoise (2.3" L * 1.5" W * 0.5" H) Materials: natural abalone shell, silver plated alloy Features: 1. 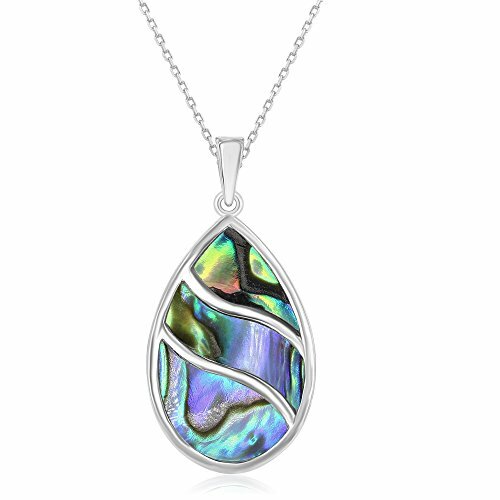 The color of the abalone shell is very bright, and it can improve the charm of the wearer. 2. The head of owl is movable, and especially lovely. 3. 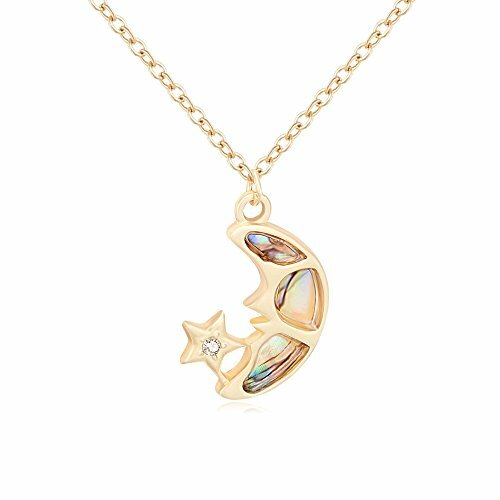 The bail width of pendant is very large, and the chain on the market can be passed through. 4. It can make brooch and necklaces that accessorize perfectly with any outfit. 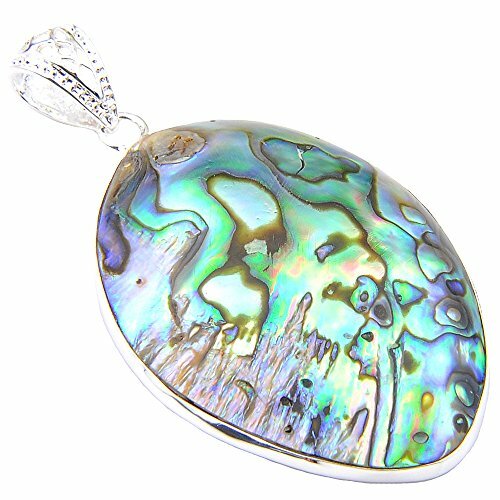 Package Includes: mix shaped natural abalone shell pendant * 3 It will be our happiness to bring different kinds of items for jewelry making to customers who are also extremely obsessed with them.Please feel free to contact us if you have any questions, problems or even disputes, our friendly customer service teams are always here with you. 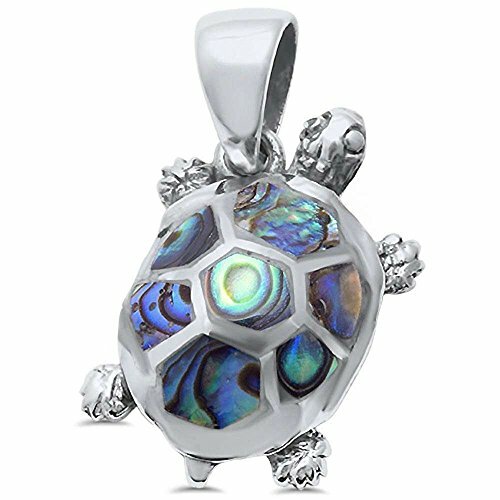 Chuvora 925 Sterling Silver Natural Abalone Shell Inlay Sea Turtle Pendant Necklace for Women, 18"
This adorable Sea Turtle necklace would be a wonderful addition to any wardrobe. The included black velvet pouch also makes it the perfect gift for someone special. 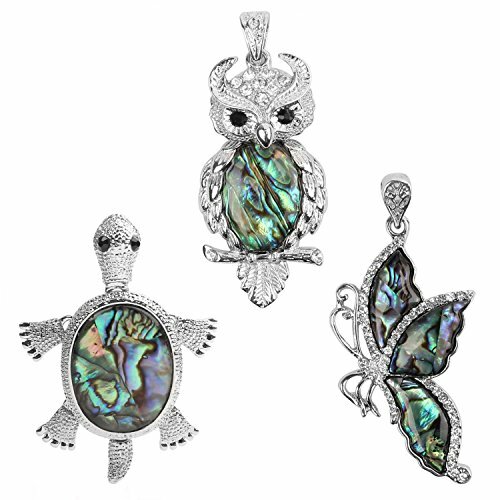 Made from natural Abalone Shell, high quality 925 sterling silver, stamped 925 Nickel Free. The pendant comes with the sterling silver snake chain 18'', Spring ring clasp About Chuvora JewelryChuvora Jewelry is a Mystic Clothing brand based in Palm Coast, Florida. Despite our rapid growth, we have remained loyal to our original hallmarks: Quality and value, ease of ordering, and integrity. GemstonesWhen present, gemstones may have been treated to enhance properties such as color and durability. See listing details for treatment disclosure information. Jewelry Care While Chuvora products are designed to last, proper care is an important part of keeping your jewelry looking it's best. Be sure not to wear your jewelry while cleaning or working with harsh chemicals, in pools or spas, or while playing sports. Store your jewelry individually to keep them from scratching each other. Store sterling silver jewelry with anti-tarnish strips to keep them looking their best. To clean your jewelry, use a warm, soapy water soak and a soft brush - especially when cleaning jewelry that contains gemstones. 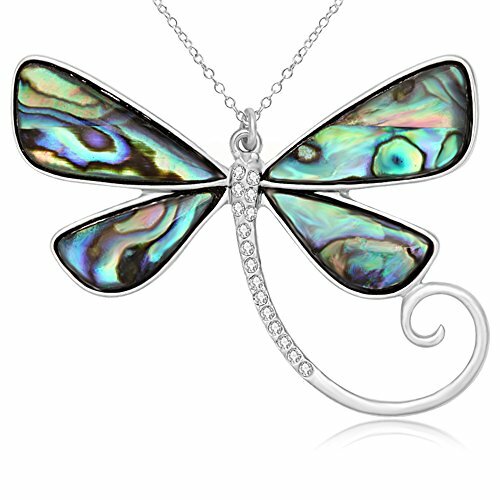 SENFAI Dragonfly Natural Abalone Shell Pendant Necklace 18"
Compare prices on Natural Abalone Shell Pendant at ShopPlanetUp.com – use promo codes and coupons for best offers and deals. We work hard to get you amazing deals and collect all available offers online and represent it in one place for the customers. Now our visitors can leverage benefits of big brands and heavy discounts available for that day and for famous brands.